Nothing is more frustrating than looking for your tablet, handheld or mobile device & realizing that you don’t have a charge AND that you can’t find your power cords. I don’t think I’m the only person that has this dilemma. I have 3 digital cameras, an iPad & iPhone not to mention the mobile devices everyone else charges in the house & the power cords all start looking alike. Our Tabletop Charging Stations eliminate this frustration. They are ideal for your kitchen & the home office, or from the classroom to the computer lab. The benefit is that the power, charging unit & your devices stay together & organized. When idle, during charging & if when moved to a new location ALL your equipment is organized & charged. Provide an organized solution & you have far better results in STAYING CHARGED & ORGANIZED. 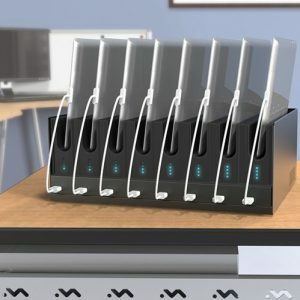 What is our criteria for making the Top 5 tabletop charging station solutions? Convenience – Eliminates clutter, Easy-to-use, Organized, Ready! Value – These 5 affordable solutions will provide safe dependable charging & therefore extends the life of your mobile device investment. That’s value! The Balt 27690 iTeach Desktop Tablet Charger can easily charge up to eight USB tablet or phone devices right on your tabletop. The controlled power management knows which devices need more power, helping to extend battery life & saving energy. Includes four charge indicators & on/off power switch. Charge up to eight devices with one power cord to the wall. Charge different kinds of devices at the same time. 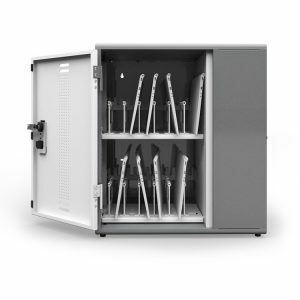 Our Secure & Charge Station is designed for learning environments to keep Tablets, ChromeBooks & Mobile Devices organized, available, fully charged, & ready for classroom use. 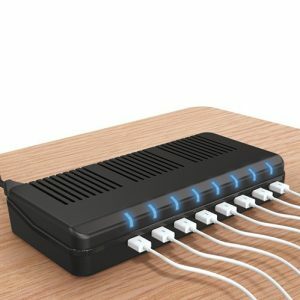 The station can even store & charge different kinds of devices at the same time, each with its own charging cable or adapter making the 10 unit charging station ideal for family & office charging as well. Secure & manage your mobile devices with this elegant, affordable solution. Lots of laptops, limited space? Store & charge up to 12 devices with the wall mountable Chromebook Charging Cabinet! One size fits all Chromebooks, Surface Pro 3 , MacBook Air & other mini-laptops. Set the cabinet’s bay width & shelf height for your devices – up to 13” screen & some with 14” screen – then reconfigure when it’s time for new devices. Mix & match mini-laptops, tablets, & handhelds for even more flexibility. All this with a budget friendly price & Anthro Lifetime Warranty. 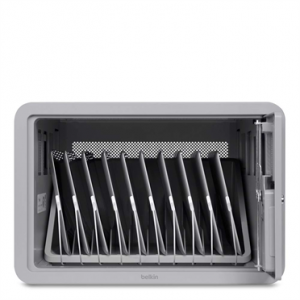 Tech Tub is designed for ChromeBooks a variety of tablets. Made from highly durable, heat-resistant ABS plastic & vented to ensure airflow, Tech Tubs are secure, mobile & lightweight. Tech Tubs support a “grow your technology” approach to purchasing. Overall Dimensions: 13″w | 16.125″d | 14″h, Slot Dimensions: .625″ | 12.25″w | 11.25″h. Tablets are protected & recharged with the inserts & the foam pad on the bottom of the Tech Tub provides cushioning & includes a six outlet power bar, cable management, a padlock & locking block to prevent theft. We actually have more solutions that would make the top 5 tabletop charging list & you can see them on our website with full details, dimensions, pricing, features & benefits. I know from experience that “left to our own devices” it’s pretty easy to get sloppy with charging equipment & then are pretty disappointed when they are not charged. I believe when you get organized properly it is far easy to STAY ORGANIZED. Give us a call Bakagain at 336-701-2333, we are happy to help you choose the perfect solution for your home, office or school! Shop on our website or request a quotation today!